Letizia is the PR Manager at Maison Margiela. Hyperactive, she does all kinds of group classes from combat to sculpting, stretching and flow - all preferably at lunch time, choosing studios, gear and a laps at the pool over leisurely lunches in the restaurants around the cool Goncourt area near her office. Jacket: Surface to Air. Jeans: Topshop. Shoes: Christian Louboutin. Bag: Pourchet. All Images by Corinne Stoll. INSIDE/OUT: What was the first sport you ever practiced? Letizia: Ballet. My teacher was dancing at the Opéra de Paris and taught a very traditional method. She attached our feet to the barre to improve our pointes and make us dance with boxing gloves if we were biting our nails! L: Yes, of course. Pushing my limits and the satisfaction of reaching my goals make me more confident and also stronger to face the challenges of everyday life. I am better prepared because sports allows me to relieve stress and get clear my head. When I'm working out, I don't have time to think about that same conversation I had with someone fifteen times; I don't have time to think about all my little problems and the way they affect me. I think about my goals, about how many laps I still have to swim, about the older lady next to me who does more push-ups than me...or I just try not to think at all! Outfit: Lululemon. 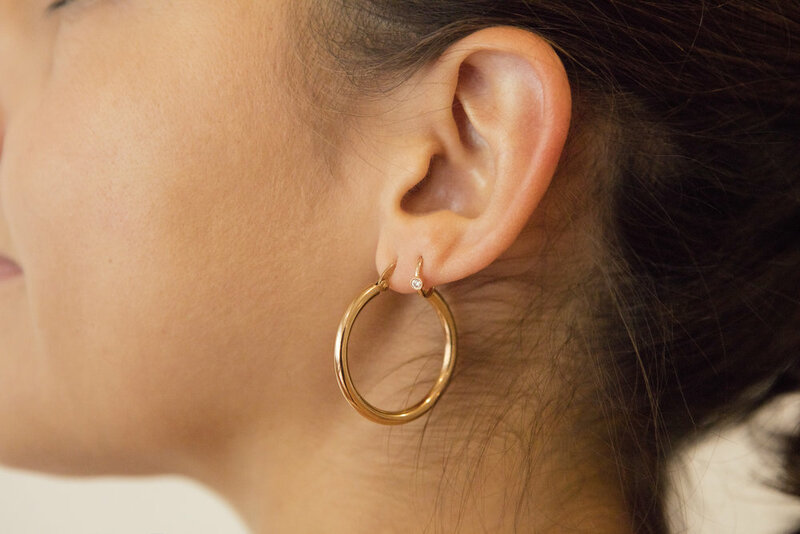 Earrings: Vintage. Ring: Maria Tash. L: I to deal really well with balance in order to not get frustrated. Mostly I have to find the right amount of time for work, personal fulfillment, my couple and our child. And modify it over time. No more improvisation, no more spontaneity! I have a shared calendar with my partner and we plan a lot. Our nights out with friends, our weekends on our own or with some friends and even the moments we get to spend alone. I now go to sports at lunch time in order to have time after my day of work, to see friends or just spend some time with family. But when fashion week comes, work takes over for an entire month and I just have to deal with it. I eat bad food, don't work out anymore, don't see my kid and just barely bump into my boyfriend. Then, Paris empties out again and I get my good habits back. At least, I try. After a time of adaptation. I/O: How would you define the relationship of the Parisienne to sports and wellness? L: She practices sports and diets all year long... But she doesn't talk about it! I/O: Do you think that Paris has a new way of including sports in its lifestyle today? L: Oh yes! More and more people around me are practicing activities. Of course, less than my Australian or American friends. But sports are now integrated into their schedules. These activities lead to a new lifestyle and have transformed fashion as well. It is now OK to wear leggings! This has influenced food habits, too: you say 'no' to a drink because you're detoxing before a race. And socially: it's cool to do sports selfies. At work I will accept a 50-hour week as long as I can go to my classes. And finally, your friendships are affected: I have become friends with people who have the same lifestyle as I.
I/O: And what about sportswear? L: Sportswear actually exists in France now! And it was not really the case before. Of course, we had sportswear brands but only lifestyle and not performance. I think about Fila, Lacoste, Nike, etc. I grew up in the suburbs of Paris (93) and everybody was wearing sportswear but no one actually did any physical activity. It was all about style! I/O: What's the "French Touch" of sports? L: That would be missing your class because you would rather have a drink with your friends on a terrace. I/O: Your favorite activewear garment? L: My 7/8e Lululemon Wunderunder leggings. I/O: Your favorite athleisure brand? L: I have three. Lululemon, Outdoor Voices and Alo. I would like to cite a French brand but no one really took that challenge yet here. They APC collaboration with Outdoor Voices was nice, though! I/O: Your essentials for sports? L: A really good pair of socks. I did not think it was so important but there is no way back when you realized it. It's my latest discovery. I/O: Do you do all black head to toe or are you more comfortable in colorful? L: Black head to toe. I tried the American colorful way but I am just not credible in pink! Outfit: Ollé. Shirt: Ralph Lauren Vintage. Scarf: Léonard Vintage. Bag: Pourchet. I/O: What's your thoughts on female empowerment? Do you think that women can go further together? L: I am definitely a feminist but I don't particularly claim it when I do sports. I am feminist in my everyday acts. When I workout, I try to leave my ideas, my frustrations inside the locker room, and it feels good. What I see today, in particular on social networks, does not do justice to feminism. The cult of perfect bodies with outlined abs and butts, the never-ending sports selfies, the guilt-inducing hashtags...all of this does not give me the feeling that women support each other. Women suffer a huge pressure to make their bodies beautiful objects. They forget that they can also be their own persecutors at times. I/O: Have you already make friends through your activities? L: Yes, sports create closer bonds. I would rather say that I get closer to the people I already know when I take classes with them. It is intimate to do these activities with people, eventually. 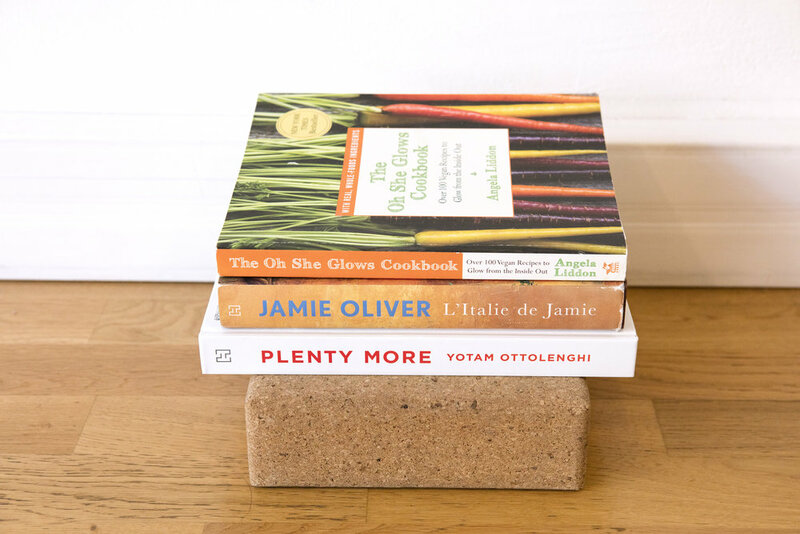 Books: "Plenty More" by Yotam Ottolenghi, "Italia by Jamie" by Jamie Oliver, The "Oh She Glows" Cookbook by Angela Liddon. Lipstick: MAC. Rings: Maison Margiela and Kenzo. Perfumes: Replica "Walk on the Beach" by Maison Margiela. 1 tip to improve your performances: Meeting someone! But it does not always work. And also find complementary activities in order to avoid big muscles. I do cardio, core renforcement through yoga and swimming as streching. 1 coach: Muriel Dal Corso, Vinyasa flow coach in Paris. 1 trip: a Vipassana in the Yarra Valley, next to Melbourne. 1 power song: I have many but let's say "Margeritha" by Todd Terje, "Let it Happen" by Tame Impala and all of Rihanna's hits. 1 app: My Fitness Pal. Because it helps you see and analyze what you eat. 1 blog: Oh She Glows for healthy vegetarian food. 1 food address: Soya for lunch, Panache at dinner. 1 drink: sparkling water with a bit of lemon granita. 1 person we should interview: Rosie Ward and Alicia Whillas, founders of the swimwear brand Ward Whillas.